More popular worthless thing thanPET bottle, it is difficult to find. Sales of carbonated soft drinks, mineral water and light the alcohol to the summer increase many times, which means that even for large structures out of plastic bottles Consumables enough. 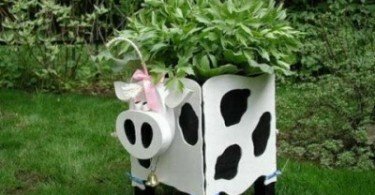 Gardeners have long appreciated the practicality of the packaging, are actively using it as a seedling pots, boxes for small items and molds for the kids playing in the sandbox. But the possibility of using plastic containers do not end there. 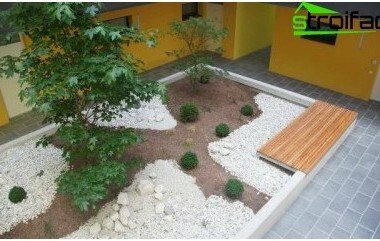 This material has a number of features that allow to create not only an exclusive landscape decoration, but practical and durable design. plastic bottle itself can withstand the load solid and water-filled timber becomes stronger. 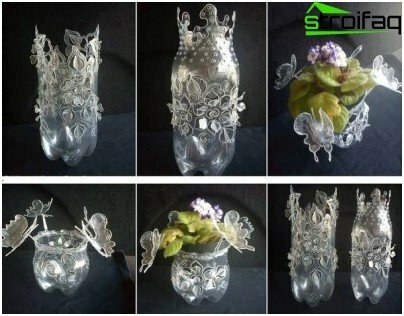 These qualities are free of charge and made the plastic bottle one of the most popular materials among fans exclusive holiday decor. 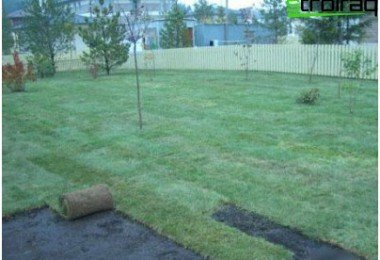 The easiest way to organize the flower beds ofplastic bottles - basic okantovyvanie areas prepared for planting. Etched into the primer packaging not only decorate a flower bed with flowers, but will keep the land from being washed away. Plastic parts can be used in "original form", leaving them with a factory color, but they are easily and staining. Enamel or acrylic paint with the addition of caramel expands the horizons of imagination. The very bottom of a bottle, someone designed in the form of Five-petalled flower, by pouring a contrasting color looks very elegant, turning into a daisy. 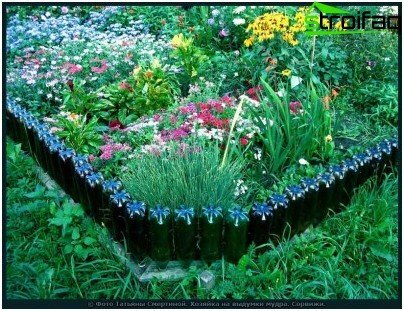 Established own hands flowerbed of the bottles will stand without deformation longer if the ground before the instillation container filled with water. In addition, if the bottle did not stain herself, the sun's rays, refracted in the water, turn into sparkling sunbeams, scatter along the paths of self-made beds. 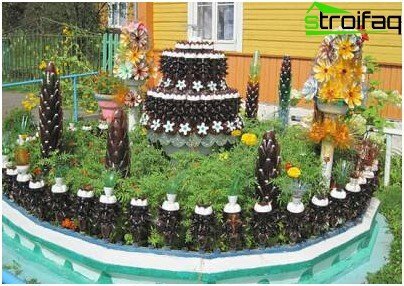 Decoration beds with plastic bottles - an interesting and exciting experience. 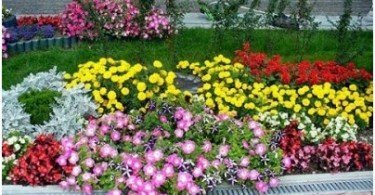 The enclosure can be both colorful and monotonous, very simple bed for flowers or intricately shaped rugged, flat or tiered. Higher construction can be arranged"Woodpile" method. 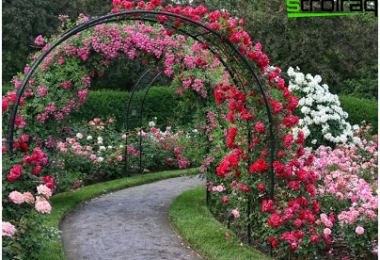 The height of such beds is limited only by the wishes of the grower. The original plastic "wells" can safely be planted even plants creeping back as reserve strength of the structure is quite respectable. As the bonding material may be a conventional adhesive, although many masters prefer to cook monolithic structure by heating. For such work does not need even a gas burner, enough heat from the candle or soldering. Those who decided to wipe the complex forms,I have a little more work. Making beds of plastic bottles in the form of a ball or a boat requires a preliminary cut bottoms, which takes a lot. The main difficulty is to find the most original form of this cavity. The children can take an ordinary ball for support. Prepared bottoms, which can be pre-paint and countersigned in contact with the ball. After the volume is laid and dried, enough to blow off the ball and return the children. The question is how to make a bed out of bottles spherical resolved. The bottom of the structure is laid thick film, a rash preventing soil and can be planted flowers. The same structure can be used as a large vase, as it will securely hold water. Making a flower bed of plastic bottles can be monotonous and colorful. For greater structural strength cancement base kind of fence, but the bed in such a case is already fixed, and to transfer it to another location will require a serious dismantling of the foundation. No fixed model less durable, but also more mobile. Such a bed of plastic bottles is easy to disassemble. Just do not rush to throw out "building material". Bottles have not lost the form, it is sufficient to wash them clean and tidy until the next spring. 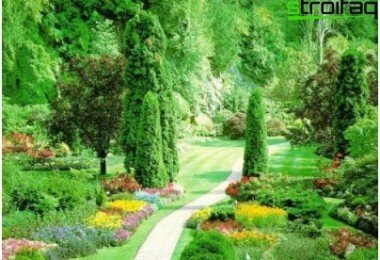 Winter months is enough to come up with more original design exclusive flower bed. 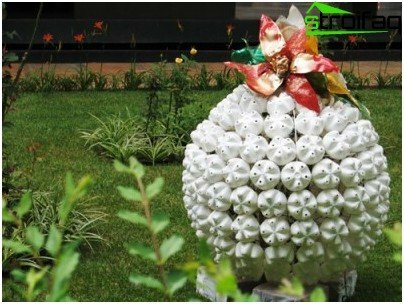 In addition to vertical surfaces flowerbedsGarden can be decorated with decorative pots of the same material. Plastic elementary cut the most common knife in the hands of the master turning into a real work of art. 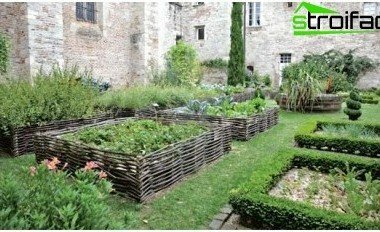 Pinned on the ropes or chains of small pots of various shapes - a great opportunity not only to put your favorite diverse vines and marigolds, but also to cover their nondescript wall agricultural buildings. The only mandatory design condition - the presence of the hole for rainwater. This will protect the soil from rotting. The holes for the ribbons holding the cups themselves, can break through the usual punch the paper. 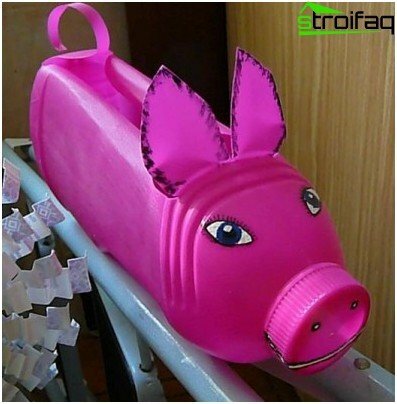 Such miniature makeshift beds ofplastic bottles can make even the children, and the process will give them a lot of fun. The only danger - the ability to be injured by sharp edges of the plastic, as children should be forewarned. However, this risk persists and planting flowers, but it is easy to prevent okantovyvaniem the cut edge of the bottle with tape or duct tape. The first and still play the role of decorative rims, thanks to the proposed producers assortment of colors. The form of a plastic bottle can tellan idea for a future composition. Someone sees in the bottoms of the flowers, someone saw the neck of the petals of tulips, someone closed lid bottles of drinking water resembles a hedgehog or a pig snout. Ideas to decorate a flower bed with plastic bottles, prompt even children. The cut side of such a sculpture, turning it into a hollow boat - a perfect place for planting a small flower. You can build a weightless sails made of plastic residues.